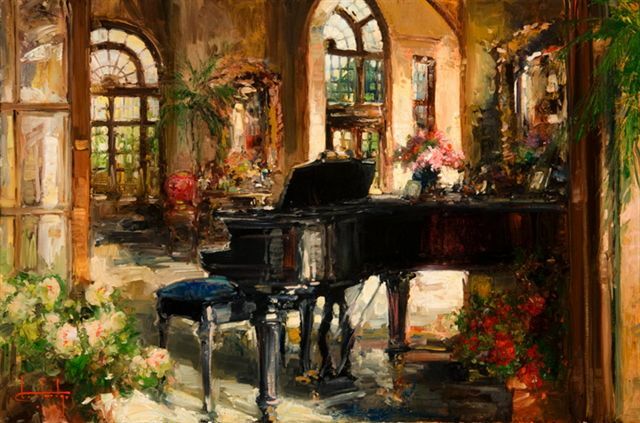 Minuet in D Minor| Painters Chair Fine Art in Coeur d'Alene, Idaho features original paintings, sculpture, prints and much more. Obviously, I paint a lot of pianos. The reason, still being, is that I find them beautiful as furniture and instrument. They are elegant in the simplest of homes, and yet, always feel at home in elegance. Minuet in D Minor is the essence of such elegance. This setting was a rail stop in Gallatin, Montana; where the wealthy in the early 1900's would stay over on trips to Yellowstone and Glacier.